If you’re a browser tab hoarder in Safari, you may find it helpful to close out of all other tabs while maintaining a specifically chosen active tab to be open. 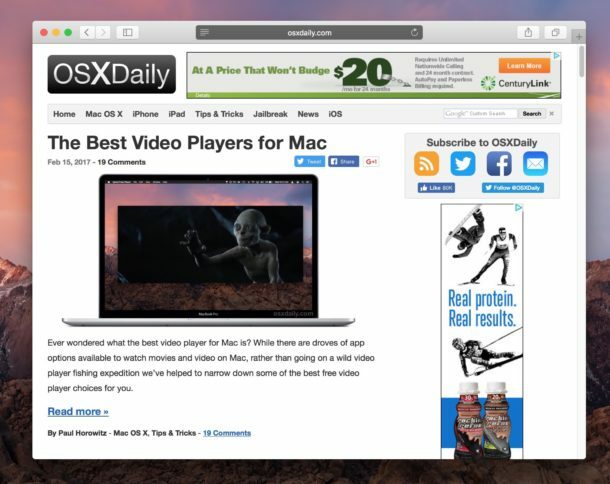 This offers a fast way for Mac Safari users to close out of tabs that are no longer needed, but without closing all other opened tabs and windows. The effect is immediately, any other opened tabs in the same Safari window will close out. This approach is obviously Mac specific, but iOS offers other ways to close specific tabs in Safari or close all tabs that are a bit different. Option-Click the close button on the tab you want to remain open and all the others will close leaving just that one. Command-W closes the tab that is currently being used. Option-Command-W closes all of the other tabs, and leaves the tab that is currently being used open. Nothing much to say, but will state how advanced apple is. So many options to do most things. Only regret is not buying one years ago and listening to the rubbish about them. I doubt I would ever buy another windows based machine unless forced to. Is there anyway to get the tabs to spread out instead of overlapping each other, when there are too many to fit on a screen width?